I have written before in this column about AFSA’s new effort to engage our members through “structured conversations” so that we can build our advocacy agenda based on a nuanced understanding of members’ aspirations and concerns. Those conversations are ongoing—I met over lunch last week with two small groups from USAID, and by the time you read this, I will have rounded out a series of lunches with specialist cadres. In the meantime, AFSA’s new Professional Policy Issues unit reviewed all the feedback received in the first round of structured conversations with the largest group of AFSA members, namely activeduty, mid-level State Department FSOs. One theme that emerged clearly is the importance of leadership. We heard how much members value strong, effective leadership. We also heard how much “toxic leadership”—a phrase used more than once—costs members in terms of commitment, engagement and productivity. And we heard a strong desire from mid-level officers for opportunities to learn how to develop into good leaders and managers themselves. This is, in my view, a big deal, a potential “tipping point” moment for the State Department. State FSOs have long valued policy prowess and the ability to write well—think of the reverence for George Kennan’s “Long Telegram.” But a cultural change has been taking place at State, and increasingly members of the Foreign Service place a high priority on leadership and management excellence, in themselves and in others. Here I must tip my hat to the Foreign Service Institute for its instrumental role in bringing about this change. 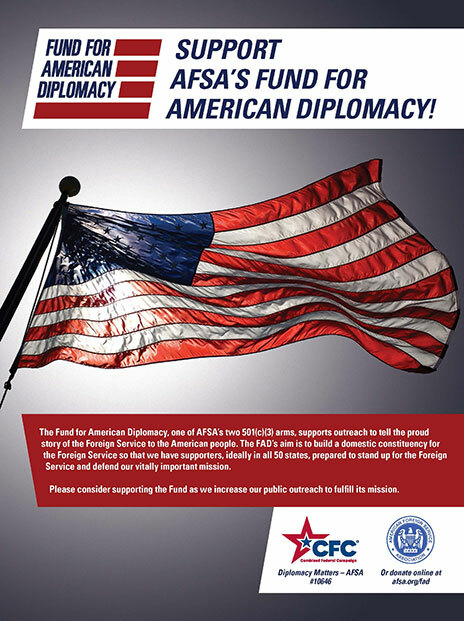 As Ruth Davis fans will know from her September FSJ interview on being named winner of AFSA’s Lifetime Contributions to American Diplomacy award this year, one of her proudest achievements was helping stand up the Leadership and Management School at FSI in 2001. It’s not simply that, as a former dean of LMS, I’m a cheerleader for leadership training—which, of course, I am. The point is this: On the basis of the structured conversations we’ve held, I can faithfully report that, far from resenting or resisting leadership training (which may be how members of my generation and before recall prevailing attitudes), many of today’s mid-level FSOs place great value on FSI’s leadership and management training—and they want more of it. Some members note that, with mid-ranks fully staffed for the first time in decades, the Foreign Service is now in a position to expand training opportunities. One sign of the cultural change taking place at State is the first-ever Leadership Day, scheduled for Dec. 13 in the Dean Acheson Auditorium. At the request of AFSA’s new—and admittedly nascent—working group on leadership excellence, chaired by a Governing Board member active in the Culture of Leadership Initiative (iLead), I promised to give the event a plug in my column and urge members to participate. For more information about Leadership Day and the work of iLead, a voluntary group of employees dedicated to improving leadership throughout the State Department, go to www.afsa.org/leadership. 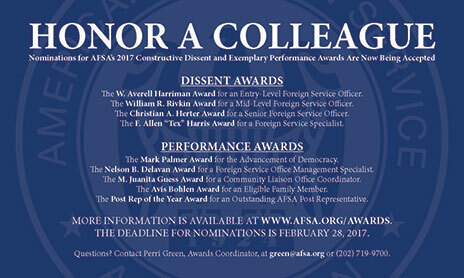 AFSA recognizes the priority members place on fostering strong leadership and management in the Foreign Service. While bearing in mind the need to respect lanes and the important work others are doing, AFSA would like to do our part to champion leadership excellence. We are weighing options for doing just that, such as bringing in speakers to feed the conversation and perhaps spark related submissions to the FSJ. Another proposal is to use an online video conferencing service to host a conversation in early 2017 with members currently stationed abroad to bring them into the discussion and point them to resources they can use to launch leadership groups at their posts. As we develop an action plan at AFSA for doing our part to cultivate leadership excellence, I encourage you to develop your own action plan. Participate in Leadership Day, answer iLead’s call to share stories of your success improving leadership where you work, and let us know your ideas. What Is the Coalition App?